Solar Flat Plate Collectors are one of the most cost-effective and commonly used type of liquid flat plate collector, which are used to generate lots of free hot water for the home as their construction and operation is simplicity itself. Solar flat plate collectors have the advantage of absorbing not only the energy coming directly from the sun, but also the diffuse solar energy that has been reflected around the collector plate itself. Flat plate collector hot water systems can be used in virtually any type of location or climate as the fuel they use to heat the water comes directly from the sun, which is absolutely free. Theses solar hot water panels use the suns rays to heat either water or some form of heat transfer fluid inside the collector with the heated water held in the storage tank in a similar fashion to a conventional electrically heated hot water tank ready for use when needed. In most domestic households, heating water is the single biggest energy use, more than cooking, with up to one third of a homes electricity and gas consumption being used just to heat water on a daily basis. This amount of energy consumption can be significantly, and in most cases, totally reduced by utilising solar energy. Unlike traditional forms of water heating, solar flat plate collectors used for heating water are inexpensive, which means that you will get your return on investment much more quickly with solar water heating. There are many types of solar heating systems and flat plate solar collectors to choose from. They are categorised depending on the solar collectors technology, panel location and heating fluid transfer method. Depending on the collector (panel) type they can be either closed-loop or open-loop, passive or active with each system having its own advantages and disadvantages. Open-loop passive systems are generally the cheapest but which system you choose will depend on your own needs, your budget and your location. A “solar flat plate collectors” typically consists of a large flat heat absorbing plate, usually a large sheet of copper or aluminium as they are both good conductors of heat, and which are painted or chemically etched black to absorb as much solar radiation as possible for maximum efficiency. This blackened heat absorbing surface has several parallel copper pipes or tubes called risers, running length ways across the plate which contains the heat transfer fluid, typically water. These copper pipes are bonded, soldered or brazed directly to the absorber plate to ensure maximum surface contact and heat transfer. Sunlight heats the absorbing surface which increases in temperature. As the flat plate gets hotter this heat is conducted through the risers and absorbed by the fluid flowing inside the copper pipes which is then used by the household. The pipes and absorber plate are enclosed in a lightweight insulated metallic or wooden box with a sheet of glazing material, either glass or plastic on the front to protect the enclosed absorber plate and create an insulating air space. This glazing material does not absorb the suns thermal energy to any significant extent and therefore most of the incoming radiation is received by the blackened absorber. There are several different ways to heat water for use in the home. Solar thermal water heating systems that use liquid flat plate collectors to capture the suns energy can be classed as either direct or indirect systems by the way in which they transfer the heat around the system. In order to heat your water successfully and use it during both the day and the night, you will need to have both a solar collector to capture the heat and transfer it to the water and also a hot water tank to store this hot water for use as needed. 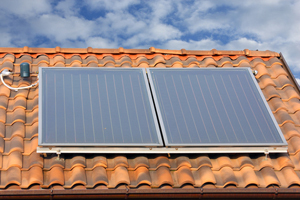 The solar thermal collector is usually connected to a water storage tank either on the roof directly above the panel or in an attic space below. With flat plate solar hot water panels and solar flat plate collectors, the hot water can flow back and forth, in and out of the tank, which continuously heats the water. Sizing Solar Flat Plate Collectors for use in a domestic solar hot water or solar heating system depends upon the hot water demand throughout the day. If your homes hot water consumption or maximum water temperature is reduced, your hot water demand may be supplied by a much smaller or less solar flat plate collectors making the system easier to install on the roof. Also, smaller systems are cheaper to install and will pay for themselves sooner through energy savings. System sizing of course depends on your hot water temperature and consumption but general rules of thumb can be used to help give an idea of a system size. A single thermal collector of 20 to 30 square feet (4 x 6 ft) could heat about 60 gallons (300 litres) of water a day which is about the size of a standard hot water storage tank. In general, you will need about 10 to 16 square feet of solar flat plate collector area per person giving about 1.5 to 2.0 gallons of hot water storage per square foot of collector area. So for a family of four persons this translates into 40 to 60 square feet of collector plate area and 60 to 120 gallons of hot water storage. Then a solar hot water heating system for a typical family of four would need at least two standard solar flat plate collectors of about 32 square feet (4 x 8 ft) each. Solar flat plate collectors seldom track the sun’s daily path across the sky as they are usually fitted to a roof at a fixed angle. However, their mounting supports usually allows the panel to be tilted towards the south (in the northern hemisphere) to minimize the angle between the sun’s rays and the panels surface at noon time. Tilting solar flat plate collectors towards the south provides a higher rate of energy at noon time and more total energy over the entire day. Correct orientation of the solar thermal collector allows for a smaller panel to be installed or higher temperatures to be reached, as well as reducing their payback period. Selecting the right solar flat plate collectors for a solar hot water heating system for your home is very important and doing a bit of research and your homework in advance will ensure that your flat plate hot water panels will meet the needs of the particular solar heating design required for your home. To gain a better understanding of how “Solar Flat Plate Collectors” work, or to obtain more solar hot water facts about the various types of solar thermal heating systems available, or to explore the advantages and disadvantages of using solar thermal energy in the home, then Click Here today to get your copy of one of the top DIY solar thermal hot water books and plans from Amazon today.